The Delhi Metro Rail Corporation (DMRC) and the Noida and Greater Noida Authorities signed an agreement for the construction of two Metro links —Noida City Centre to Sector 62 and Noida City Centre to Greater Noida — on Saturday. The two links are expected to be completed in 2017 at a cost of Rs 7,413 crore. The 6.675-km link between City Centre Metro station in Sector 32 and sector 62 is estimated to cost Rs 1,880 crore while the 29.707-km line connecting City Centre Metro station with Greater Noida will be constructed at an estimated cost of Rs 5,533 crore. On Saturday, the agreement was signed between SD Sharma, the director of business development, DRMC, and Rama Raman, chairperson and CEO of Noida and Greater Noida Authority. After the agreement was signed, two cheques — amounting to Rs 15 crore and Rs 14.5 crore — were handed out to the DMRC. Also present at the signing was Mangu Singh, Managing Director of DMRC. Noida Authority officials said the two Metro routes had received the official approval from UP chief minister Akhilesh Yadav on September 30, 2014. “There was a delay on both ends with regard to the draft MoUs. But now that agreements have been signed, payments will be processed and construction work will begin,” an official said. Authority officials said the two lines will be instrumental in boosting connectivity to Noida. The City Centre line will connect Sector 32 with Sector 62 and allow commuters to reach NH-24 without difficulty. It is expected to be completed with 36 months after construction begins. The proposed route is expected to have six elevated stations at Sectors 34, 52, 59, 61, 62 and Electronic City at NH-24. Officials said currently, the most commonly used connection between between Noida and Greater Noida is the Noida-Greater Noida Expressway. “However, public transportation on the route leaves much to be desired. The second Metro line — between Noida and Greater Noida — will boost connectivity greatly between the two,” the official said. The Noida-Greater Noida Metro line will start from the Noida City Centre in Sector 32 and head to Greater Noida via stations in Sector 50, 51, 78, 101, 82, Dadri Road, 83, 85, 137, 142, 143, 144, 147, 153 and sector 149 in Noida. It will enter Greater Noida at Knowledge Park II, go through Pari Chowk, Sector-Alpha 1 and Sector-Alpha 2 before terminating at the Depot station, proposed to come up near Knowledge Park IV in Greater Noida. This route will be commissioned by 2018. NOIDA: The Delhi Metro Rail Corporation and the Noida and Greater Noida authorities signed an MoU on Saturday for two key Metro corridors in the twin cities. The two routes – Noida City Centre to Greater Noida and Noida City Centre to Sector 62 – will provide relief to thousand of commuters. The MoU was signed between DMRC director of business development S D Sharma and Rama Raman, chairperson and CEO of Noida and Greater Noida Authorities in the presence of DMRC’s managing director, Mangu Singh, and other senior officials. Laying the foundation for the commencement of the two proposed routes, two cheques worth Rs 29.45 crore were handed over to DMRC by Raman. The two routes are expected to cost a total of Rs 7,413 crores. While 6.675-km-long link from Noida City Centre to Sector 62 is estimated to cost Rs 1,880 crore, the 29.707-km-long Noida-Greater Noida corridor will cost Rs 5,533 crore. “After Delhi, UP is where the largest Metro network is being put on track. As Noida and Greater Noida urbanize at an unprecedented pace, we want to improve the two cities’ transport systems,” said Raman. Officials said that the cost of the Noida Metro line, as per the Detailed Project Report will be shared on an 80-20 basis between UP government and the Centre. The Noida-Greater Noida will be funded by the two authorities. Noida Metro Rail Company (NMRC), which was recently granted approval by the state government, will be in charge of transportation, connectivity and movement of the 29.7-km track between Noida and Greater Noida. The Greater Noida Metro track will have 22 stations, of which 13 will be at ground level, while seven stations will be elevated. Two stations at Knowledge Park-I and sector Delta-1 in Greater Noida are planned for future expansion. “Since the stretch between Noida to Greater Noida is long, this route has been planned differently,” said Mangu Singh. “We plan to have fast trains along this corridor, which may not stop at all stations,” he said. To ensure a smooth ride to commuters, the Delhi Metro Rail Corporation (DMRC) has planned to connect Noida and Greater Noida through a Metro link. Bodaki via Noida Expressway link from one side, while another 30-km stretch of this link would be via Greater Noida West area. The Metro link will have about 22 stations catering to sectors 50, 143, 144 and Greater Noida’s Pari Chowk among others. The proposed Metro link will have two parts— Greater Noida’s Bodaki to Noida’s City Centre via Greater Noida West and Greater Noida’s Bodaki to Noida’s City Centre via Pari Chowk. Officials of the corporation said that the 60-km loop would consist of two separate stretches, which would be built in next four-five years. According to the DMRC and the Noida authority, work on Noida’s City Centre to Greater Noida’s Bodaki, a 30-km-long link, is likely to begin by January next year. Detailed project report (DPR) of seven-km-long link, a part of 60 km ring’s second stretch- Noida’s City Center to GreaterNoida West (Noida Extension) crossing is being made. The DMRC spokesperson said they would expedite the proposed Metro projects connecting Noida and Greater Noida with Delhi or other parts of National Capital Region (NCR). “The Noida Metro Rail Company (NMRC) is about to be formed. Also, MOU with the DMRC is likely to be executed soon. Once the MOU is done, we will start work on the 30-km-long link next year,” said Rama Raman, chairman of the Noida and Greater Noida authorities. The two authorities — Noida and Greater Noida — have allocated a budget of about Rs. 10,000 crore for four Metro projects to be completed in next four-five years. NOIDA: Noida and Greater Noida Authorities held a meeting on Tuesday to accelerate the Metro link project. Officials said an MoU could be signed soon. The proposed Noida Metro Rail Corporation, which was recently granted approval by the UP government, will be responsible of the transportation, connectivity and movement of the 29.7km track linking Noida and Greater Noida. A team of officials has been formed by the chairman and CEO of Noida and Greater Noida authorities to speed-up formation of the company. Once the draft MoU is approved by the government, Noida and Greater Noida authorities will formally ink on the dotted line. “We expect it to come through next week,” said the official. “Work on the track will commence as soon as the MoU is signed,” he added. According to estimates of DMRC and the two authorities, nearly 65,000 passengers are expected to use the link every day. The track is likely to be commissioned by 2017. The proposed route will have a total 22 stations, of which 13 will be constructed on ground, with seven elevated stations. Two stations – Knowledge Park-I and Sector Delta-1 in Greater Noida – are planned for expansion in future. Starting from Noida City Centre in Sector 32, the proposed Metro corridor will head towards Greater Noida via stations in Noida’s sectors 50, 51, 78, 101, 81 on the Dadri Road, and sectors 83, 85, 137, 142, 143, 144, 147, 153 & 149 thereafter. It will enter Greater Noida through Knowledge Park-II and traverse Pari Chowk, Sector-Alpha 1 and 2, before terminating at Depot station, proposed near the recreational greens in Knowledge Park-IV in Greater Noida. Entire Metro alignment is proposed to be elevated. Fast tracking the Noida-Greater Noida Metro link to its next step, the two authorities held a meeting on Tuesday. Officials said that the Memorandum of Understanding (MoU) for the Metro track could be signed any day now. Officials from the twin Authorities are leaving no stone unturned in putting the Metro project on track. The proposed Noida Metro Rail Company (NMRC), which was recently granted approval from the Uttar Pradesh state government, will be in charge of the transportation, connectivity and movement of the 29.7-km track between Noida and Greater Noida. The construction will be undertaken by the Delhi Metro rail Corporation (DMRC), while the project will be funded by the two authorities. A team of officials has been formed by the Chairman and CEO of Noida and Greater Noida to fast track the formation of the company. “This team will focus on and speed up the registration of the NMRC,” said an official. Meanwhile, once the draft MoU receives an approval from the government, Noida and Greater Noida will formally ink the dotted line. “We are expecting it to come through next week,” said the official. “After the MoU is signed, work will commence on the track,” he added. According to DMRC and the Authority’s estimates, nearly 65,000 passengers are expected to use the link every day. The track is estimated to be commissioned by 2017. The proposed route will have a total 22 stations, of which 13 will be constructed on ground while seven stations will be elevated. Two stations at Knowledge Park-I and sector Delta-1 in Greater Noida are planned for future expansion. Starting from Noida City Centre in Sector 32, the proposed Metro corridor will head towards Greater Noida via stations in sectors 50, 51, 78, 101, 81, on the Dadri road, 83, 85, 137, 142, 143, 144, 147, 153 & sector 149 in Noida. It will enter Greater Noida through Knowledge Park-II and traverse Pari Chowk, Sector-Alpha 1 and 2, before terminating at Depot station proposed near recreational green, Knowledge Park-IV in Greater Noida. Entire Metro alignment is proposed to be elevated. Metro connectivity in Noida received a big push on Tuesday with UP chief minister Akhilesh Yadav clearing two major routes — a 29.7 km line from Noida City Centre (Sector 32) to Greater Noida, and another 6.7-km stretch from City Centre to Sector 62. NOIDA: Metro connectivity in Noida received a big push on Tuesday with UP chief minister Akhilesh Yadav clearing two major routes — a 29.7 km line from Noida City Centre (Sector 32) to Greater Noida, and another 6.7-km stretch from City Centre to Sector 62. The City Centre-Sector 62 link isa Rs 1,816 crore project while the Noida-Greater Noida route is estimated to cost Rs 5,064 crore. Both are expected to be complete by 2017. At a cabinet meeting in Lucknow, Akhilesh authorized Noida Authority chairman and CEO Rama Raman to set up a special purpose vehicle called Noida Metro Rail Corporation and to enter into a memorandum of association and article of association with the company. The UP government has also appointed DMRC as the turnkey consultant for putting both long-awaited projects on track. The approval granted to Metro extension in Noida on Tuesday is the second in three months granted by UP chief minister Akhilesh Yadav. In June, he had approved the 3.9 km, Rs 845-crore Botanical Garden-Kalindi Kunj Metro link. Officials said the cost of the City Centre-Sector 62 line will be shared on an 80-20 basis between UP government and Centre. The Noida-Greater Noida line, on the other hand, will be funded by the two authorities. The City Centre to Sector 62 line will touch NH-24, and will benefit people commuting within Noida and also going to Ghaziabad. It will provide connectivity to sectors 32, 34, 35, Hoshiarpur, sectors 51, 52, 71, Greater Noida Extension Marg, Sarfabad, sectors 60, 61, 62, 63 and NH-24. The proposed route will have six elevated stations at sectors 34, 52, 59, 61, 62 and Electronic City (NH-24, Ghaziabad border). These new stations on the extended route will benefit commuters on both sides of NH-24 and also provide a solution to the traffic congestion faced along this path. This route is expected to be completed within 36 months once construction starts. The Noida-Greater Noida Metro track will have 22 stations, of which 13 will be constructed on ground while seven will be elevated. Two stations at Knowledge Park-I and Sector Delta-1 in Greater Noida are planned for future expansion. Starting from Noida City Centre in Sector 32, the proposed Metro corridor will head towards Greater Noida via stations in sectors 50, 51, 78, 101, 81, Dadri Road, 83, 85, 137, 142, 143, 144, 147, 153 and sector 149 in Noida. It will enter Greater Noida through Knowledge Park-II and traverse Pari Chowk, Sector-Alpha 1 and 2, before terminating at Depot Station proposed near Knowledge Park-IV in Greater Noida. The entire Metro alignment is proposed to be elevated. “As Noida and Greater Noida urbanize at an unprecedented pace, we want to improve transport systems between the two cities,” said Noida CEO Rama Raman. “The need is to put in place an effective and flexible community transport system. We will continue to push for approvals on all pending Metro route extensions like the 66 km route between Greater Noida and Indira Gandhi International airport and the 20.6 km Metro rail route between Greater Noida and Yamuna Expressway, with the relevant authorities and soon put them on track, too,” Raman said. Officials said that though planned much earlier, the change of guard in UP resulted in the Metro extension from City Centre station to Sector 62 being put on hold. Finally, in April 2013, the UP government gave an in-principle approval to the proposed route. The Metro link between Noida and Greater Noida was first proposed in 2010 and received a go-ahead from the ministry of urban development in April 2014. The ministry had also cleared DMRC’s appointment as a consultant for the project on a turnkey basis. “We have completed all formalities for the MoU to be signed with DMRC,” Raman said. “We will now schedule a meeting with DMRC and fix a date at the earliest for inking on the dotted line for both routes,” he added. “Construction will start as soon as we make the payment,” he added. NOIDA: Touted as world-class investment destinations, Noida and Greater Noida — which perform dismally when it comes to providing an effective intra and inter-city public transport system — are heading for an era of multi-layered connectivity. After the Metro project was recently approved by the state government, the public transport system between Noida and Greater Noida has got another shot in the arm, with the Noida Authority granting a new lease of life to the Special Purpose Vehicle, which has now been lying in a limbo for over two years. The Authority has invited requests for proposal (RFQ) from the six shortlisted consultants, who submitted their expression of interest for running 382 buses as part of the proposed SPV project to connect the two cities. Expressions of interest were invited from interested consultants in January this year. According to officials, the project is touted to take off in the next three months. Initially, 100 buses will be operated under the Noida Traffic Cell. These buses will run separately from the state transport buses. While 40 buses will ply in Noida, 30 will ferry passengers in Greater Noida. and the remaining buses will supplement the connectivity between both the cities. A bus depot sprawling 5 acres in sector 82 in Noida to accommodate the 100 buses that will run under the project will also be created by Noida, said the officials, adding that so far six firms are in the race for operating the buses. “SERCO India Pvt Ltd, which is currently running 50 buses in Indore, has submitted its EOI for the project,” said Sandeep Chandra, Noida’s senior project engineer, who is also in-charge of the Noida Traffic cell. “Prasanna Purple Mobility Services, which is currently providing public transport solutions across the country, is also in the reckoning. Other companies include an operator from Ahmedabad, K Log Global Pvt Ltd, City Life Line Travels and two other companies,” he added. According to Chandra, the EOIs had been handed over to Noida and Greater Noida’s technical consultant, Urban Mass Transit Company, an agency empanelled by the urban transport ministry. “Our consultants have evaluated the EOIs. After tabulation and framing the Request For Proposal, a sort of bidding mechanism, has been submitted to us with the results. This has been examined by a committee specially set up by us to take the project toits next step,” he said. The shortlisted companies will now submit the RFQ document by October 29, 2014. A pre-bid meeting is scheduled on October 10, 2014. The selected consultant will provide the services for procurement, operation and maintenance of the bus services for Noida and Greater Noida. NOIDA: The long-awaited Metro rail link between Noida and Greater Noida has got a green signal from the urban development ministry. In a board meeting held on Wednesday, the ministry approved Delhi Metro Rail Corporation’s (DMRC) appointment as a consultant for the project on a turnkey basis, sources said. The 30km link will be built at a cost of about Rs 5,000 crore. Construction work on the new link will commence after a memorandum of understanding (is signed between the Noida Authority and the DMRC, sources said. Terms of the MoU have already been approved and submitted to the UP government in Lucknow for its approval.According to officials of the Noida Authority, the MoU is likely to be signed after the general elections while work could begin in the next two months. Since former Delhi CM Sheila Dixit was opposed to the DMRC working outside the capital, the Authority had last year decided to form the Noida Metro Rail Company (NMRC) to construct this 30km line. Officials said that in view of the enormous passenger pressure on the Delhi-Noida route and a projected population of over 15 lakh in Noida and around 12 lakh in Greater Noida by 2031, a clean and efficient public transport facility, matching the transport infrastructure of Delhi, is urgently needed in the region. A total 22 stations are proposed on the route – 13 on ground and seven elevated. Two stations at Knowledge Park-I and sector Delta-1 in Greater Noida are planned for future expansion. Starting from Noida City Centre in Sector 32, the proposed Metro corridor will head towards Greater Noida through stations in sectors 50, 51, 78, 101, 81, 83, 85, 137, 142, 143, 144, 147, 149 and 153. It enter Greater Noida through Knowledge Park-II and cross Pari Chowk and sectors Alpha-1 and 2 before terminating at a station proposed near Knowledge Park-IV in Greater Noida. The entire route will be an elevated track. This project is expected to be completed by 2017, officials said. Noida had first approved the detailed project report of the link in 2010. But since then, the project has remained in limbo. Earlier, the Authority had planned to build this Metro link on public private partnership model, but now the two industrial authorities of Noida and Greater Noida will fund this project. Work on these two proposed Metro links is likely to begin by the end of May. 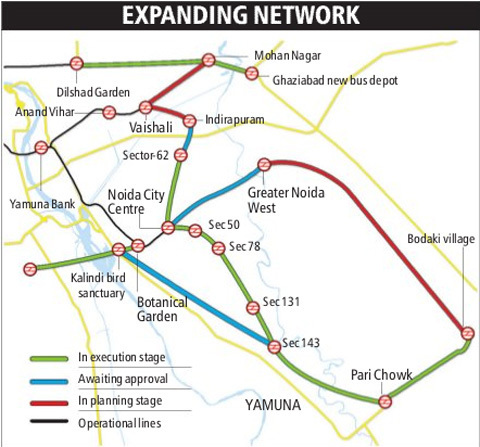 The project reports about the extension of two major Metro lines in Noida — the 3.9 -km link between Botanical Garden and Kalindi Kunj and the 6.6 -km City Centre to Sector 62 link — were approved by the Uttar Pradesh government on Saturday. The Noida authority had on May 12 last year sent the detailed project report (DPR) of the Kalindi Kunj link to the UP government, and the Sector 62 link DPR was sent in January this year. Officials said that work on these two proposed Metro links is likely to begin by the end of May this year. The two projects would cost around Rs.2,661 crore. “The deadline for the completion of the line from Botanical Garden to Kalindi Kunj has been set for 2016. Besides, construction work of City Centre to Sector 62 link is expected to be completed by 2017,” Noida authority CEO Rama Raman said. NOIDA: Clearing all tracks, the Uttar Pradesh government has given an in-principle approval to two proposed routes of the Metro rail project in Noida. The two routesâ€” a 3.9-km route between Kalindi Kunj and Botanical Garden and the 6.7-km City Centre-Sector 62 linkâ€”will be built as elevated corridors. Investment in the twin projects is estimated to be about Rs 2,660 crore. The proposal for the two routes, which got the long awaited nod, along with the state government’s recommendation has been forwarded to the Centre for approval. “The file has been sent to the Urban Development Ministry for approval. Once we receive the go ahead, the MoU with DMRC will be signed and construction will start,” said Rama Raman, CEO, Noida, who also holds charge of Greater Noida and Yamuna Expressway Authorities. As per the detailed project reports (DPRs) for the two proposed routes, the extension route from the City Centre Metro station at Sector-32 is proposed to link Sector-62. The line will be routed over the central verge of the Master Plan road-III from Sector-32 onwards in Noida. 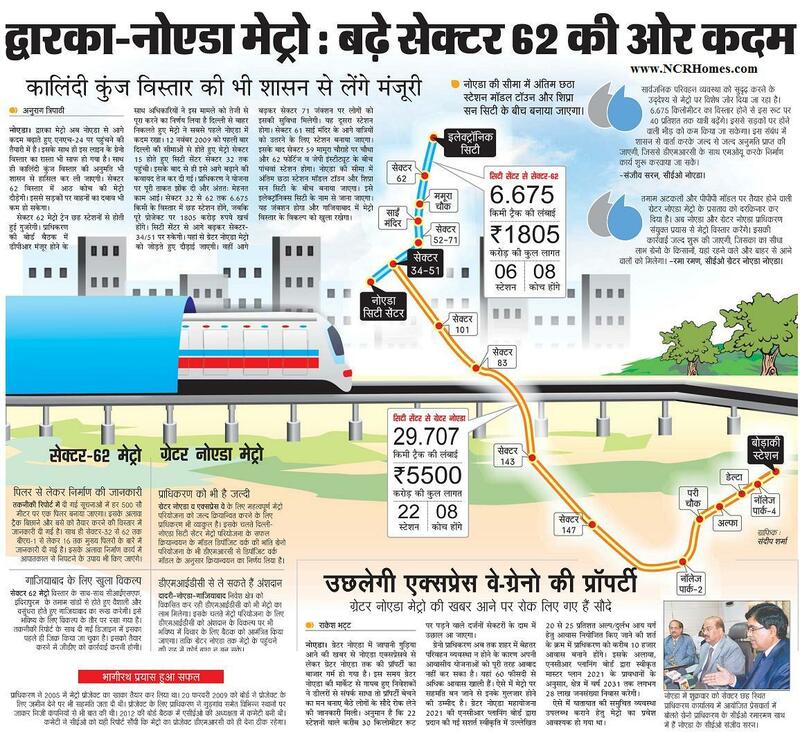 This 6.675 km line will come at a cost of Rs 1816 crore and will provide connectivity to sectors 32, 34, 35, Hoshiarpur, sectors 51, 52, 71, Greater Noida Extension Marg, Sarfabad, sectors 60, 61, 62, 63 and NH-24. The proposed route will have six stations at sectors 34, 52, 59, 61, 62 and Electronic City (NH-24, Ghaziabad border). “These new stations on the extended route will benefit commuters on both sides of the NH-24 and also provide a solution to the traffic congestion faced along this path. It is expected to be completed by March 2017,” officials said. The second proposed 3.963km Botanical Garden – Kalindi Kunj Metro line, which is part of DMRC’s phase-III plan, is estimated to cost Rs 845 crore and expected to be complete by March 2016. As per the DPR the cost of the Metro line over the Yamuna Bridge is to be shared on a 50-50 basis between the Noida and Delhi governments. The proposed line will connect Botanical Garden station with Hauz Khas station on line-2 (Huda City Centre to Jahangirpuri) via Amity University, Kalindi Kunj and Kalkaji temple station. Commuters will get three exchange points on this route. The trains on the proposed route will have 6 and 8 coaches, respectively. Officials said that an elevated viaduct methodology will be used over pre-stressed concrete box shaped girder with pile and open foundation for the construction of both corridors. A stabling depot with washing facilities has been proposed in the vacant area near NH-24, for the Sector 32 – Sector 62 route. However, the Kalindi Kunj maintenance depot shall cater for the Kalindi Kunj – Botanical Garden corridor. NOIDA: The Noida and Greater Noida authorities on Friday approved the much-awaited 30km extension of the Metro line to Greater Noida which would not only provide a fast link between the two townships but also bring these places closer to the national capital. The decision was taken at the 178th joint board meeting of the authorities, convened after being postponed several times in the past six months. The line, to be funded the Noida authority and built by the Delhi Metro Rail Corporation, will have 22 stations connecting some of the busiest spots across Noida and Greater Noida. The project is expected to cost around Rs 5,000crore. Sources said the proposal will be sent to the Uttar Pradesh government for approval on Monday. Sources expect work to start next month and the line to be ready in two-and-a-half years. The authorities expect the Metro announcement to boost the realty sector in both townships. The detailed project report for the line has already been prepared by DMRC. The authorities had earlier been mulling a public private partnership model but decided on using the Noida Authority’s own funds for the project. The line will extend from City Center and culminate at Bodaki in Greater Noida. Some of the proposed stations on the route include Sector 51, Sector 50, Sector 78, Sector 101, Sector 81, Dadri Road, Sector 83, Sector 137, Sector 143, Sector 147, Sector 144, Sector 153, and Sector 149 in Noida and Knowledge Park 2, Pari Chowk, Alpha 1 Alpha 2, Delta, Knowledge Park 4 and Bodaki (depot stations) in Greater Noida. According to DMRC and the Authority’s estimates, nearly 65,000 passengers are expected to use the link every day. The joint board meeting also gave its nod to the proposal to extend the City Center Metro line by 6.67km to Sector 62, touching NH 24. The DPR for this much-delayed project will be forwarded to the state government now. Meanwhile, the Authority has decided to go ahead with civil work on the Metro link between Noida and Greater Noida west (Noida Extension) that it had proposed earlier last year. However, the DPR for the project will be prepared by DMRC only after a sizeable population moves into Noida Extension. While the idea for a Metro link between Noida and Greater Noida was initially proposed in 2010 during the reign of the BSP, the project could not take off at the time. It got further delayed due to a change of regime and delay in the appointment of senior Authority officials. The Noida and Greater Noida authorities have recently approved the much-awaited proposal for extension of the Metro line to Greater Noida. This project will accord fast connectivity between Noida and Greater Noida, and connect these places to Delhi and Gurgaon on this rapid access corridor. The proposed Metro line is to be funded by both the authorities and will be built by the Delhi Metro Rail Corporation (DMRC). The proposed Metro line will have 22 stations connecting some of the busiest spots across Noida and Greater Noida. The detailed project report (DPR) for the line has been prepared by the DMRC. The project, estimated to cost around Rs 5,000 crore, will commence soon and is expected to be complete by 2016. The Noida authority will pitch in with the funds; earlier the authorities had mooted a public-private partnership model to raise funds. The Metro line will run along the expressway, from City Center, Sector 32 and end at Bodaki, Greater Noida. The proposed stations on the route will be located at Sector 51, Sector 50, Sector 78, Sector 101, Sector 81, Dadri Road, Sector 83, Sector 137, Sector 143, Sector 147, Sector 144, Sector 153, Sector 149 , Noida and Knowledge Park 2, Pari Chowk, Alpha 1, Alpha 2, Delta, Knowledge Park 4 and Bodaki, Greater Noida. According to the DMRC and the authority’s estimates, nearly 65,000 passengers are expected to use this new Metro line every day. The Noida-Greater Noida authorities also gave their nod to extend the City Center Metro line by 6.67km to Sector 62, touching NH-24. The DPR for this much-delayed project has been forwarded to the state government now. In addition, the Noida-Greater authorities have also decided to go ahead with the civil work on the Metro link between Noida and Greater Noida West (Noida Extension), which was proposed early last year. The DPR for the project, too, will be prepared by the DMRC. The authority will increase the floor-are ratio (FAR) from existing 2.75 to 3.5 in certain areas to raise the funds through builders and developers. For this, the authority will develop 1km special corridors along Noida-Greater Noida Expressway. The FAR would be sold for group-housing projects dotting the expressway. The 30km-long Metro line will directly connect Noida City Center in Sector 32 to Greater Noida. The Noida-Greater Noida Metro track via expressway is estimated to costs around Rs 150-200 crore per km. The Metro line being extended to several parts of Noida-Greater Noida is expected to cover more than 1.5 lakh homes in the next 1-2 years. Areas like Noida-Greater Noida expressway sectors, Greater Noida West, Noida’s Sectors 71, 72, 78, 62, etc, are still not covered in this scheme. This service would entail another 50km of Metro network. The existing Sector 32 Metro line will be extended up to Noida Extension via Sector 72. The 7km-long stretch will cost around Rs 1,400 crore of which Rs 1,100 crore would be shared by the Noida and Greater Noida authorities, depending on the territory falling under their jurisdiction. At least two stations are proposed to be built on this line. The City Center Metro station, which is proposed to link Sector 62, would branch out at Sector 71 to take the line till Noida Extension (Greater Noida West). A senior officer of the Noida authority said: “The project could not take off on the time due to several reasons. The Noida-Greater Noida authorities have finally decided to revive the project and have approved it.” The Noida authority also reviewed the detailed project reports (DPR) for the extension of existing DMRC services. A 3.9km line between Kalindi Kunj and Botanical Garden in Noida will be constructed at a cost of Rs 845 crore. The Noida authority will pay Rs 492 crore for this. Another extension will also be made on the line from Sector 32 to Sector 62 at a cost of Rs 1,816 crore. This will be 6.6km long. The Noida authority has sent both these proposals to the UP government for approval. The sanction on Botanical Garden-Kalindi Kunj line is expected to come early. Once the proposal for the Botanical Garden-Kalindi Kunj line gets the nod, the Noida authority will sign a MoU with the DMRC and work is expected to commence within three months. 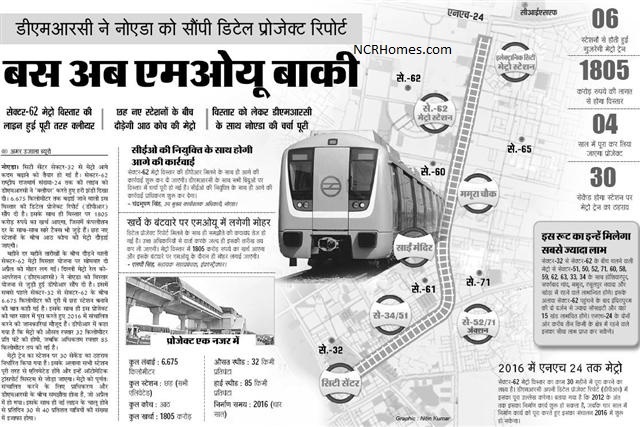 The announcement of the extension of the Metro line to Greater Noida will boost the realty markets of Noida and Greater Noida. This will also increase the value of properties on the Noida Expressway and Noida Extension, where several reputed developers have their projects coming up. Some experts have pegged this appreciation at around 30-35%. To improve public transport system between Noida and Greater Noida, both the authorities have chalked out a detailed plan which would provide metro connectivity between Noida and Greater Noida. The construction may start within six weeks. The decision was taken during the board meeting of Noida and Greater Noida authorities on Friday. The CEOs of both the authorities decided to start the construction of metro rail between the two cities. Apart from that Noida Authority has also decided to extend the existing Metro link in Noida city. In the joint meeting, many developmental projects got their nod. The authorities also deliberated over the problems faced by the farmers of the area. “We are re-assessing the Detailed Project Report (DPR) of Metro line between Noida and Greater Noida and the tenders will be floated after the State Government agrees to the proposal and clears it. Delhi Metro Rail Corporation (DMRC) will carry out the project work while the cost will be borne by the twin authorities. Chief Executive Officer (CEO) of Noida Sanjeev Saran said that they will extend the Metro line from Noida City Centre to Sector 62. The Metro rail would start from Botanical Garden Metro station and would reach Greater Noida via Sector 32, 51, 83, 101, 143, 147 (Noida) and Knowledge Park, Pari Chowk (Greater Noida). The total length of the proposed extension is 29.7 kilometres and there will be 22 stations on this line. Whereas the existing Metro rail link will be extended upto six kms between Noida City Centre to Sector 62. The CEO said that Noida Authority is in the process of augmenting the existing bus fleet of City Bus Service and for this authority would add 170 buses in its fold. For this Noida Authority would provide `40.5 crore to the State Transport Department. Out of 170 buses, 48 buses will be in the semi low-floor category while feeder buses will be made available at all metro stations of Noida city. The CEO also announced to make one MW solar plant on the model adopted by Gujarat Government and the authority will provide five acres of land to the concerned department. Authority will also bear the cost of the entire project and the plant are planned to make the region more environment friendly. Noida: Noida and Greater Noida Boards on Friday gave green signal to Noida to Greater Noida and city Centre to sector 62 Metro rail projects. Though it was planned during Mayawati’s tenure as Chief Minister of Uttar Pradesh, the change of guard saw the project being put on hold as new officers and the state government wanted changes in the project before giving the approval. Noida CEO Sanjiv Saran and Greater Noida CEO Rama Raman told mediamen after the meeting of the two Boards that the total length of the Metro project is 29.70 kilometer. It will be run on 1433 gauge and will have 22 stations. The maximum speed of train would be 95 kilometer per hour while scheduled speed is 35 kilometer per hour. The total estimated cost at June 2009 prices is Rs.2781 crore without land and Rs.3017 crores with land. Present-day cost of the project is expected to be around Rs.5500 crores, they said. The areas to be covered under the project are Sectors 32, 51, 83, 101, 143, 147, Knowledge Park II, Pari Chowk, Sector Alpha, Delta and Knowledge Park IV. As Greater Noida Industrial Development Authority as per NCRPB master plan approval has to construct 20 to 25 percent EWS and LIG houses in near future, the authority has planned to develop 10000 such houses. Delhi Metro Rail Corporation Ltd. (DMRC) has informed that a Detailed Project Report (DPR) for extension of metro line from sector 32 to sector 62 of NOIDA in Uttar Pradesh was submitted to NOIDA Authority in June, 2012. This Proposed extension is of length of about 6.675 km. and having 6 metro stations. No Proposal has been received in the Ministry of Urban Development from Govt. of Uttar Pradesh for the extension of metro line from sector 32 to sector 62 of NOIDA in Uttar Pradesh. This information was given by the Minister of State for Urban Development Smt. Deepa Dasmunshi in a written reply to a question in Rajya Sabha today. Noida: Work on the proposed Metro route from City Centre to Sector -62 in Noida is expected to start in the month of November. Decision in this regard would be taken in the board meeting slated for the next month. It is said that the work was to get off in October. However, work may get off to a start in the month of November due to the organizing of Formula One Airtel Indian Grand Prix race. Remarkably, the length of proposed metro route from the City Centre to Sector-62 is 6,675 meter. This Metro route which stretches from City centre to Sector-62 Noida would have model town as its last station and it would be called Electronic City Station. Moreover, the railway track in the city would be elevated one. There would be six stations on the proposed metro route after its City Centre station. An expense of approximately Rs 1805 crore is expected to be incurred on it. As per the Detailed Project Report (DPR), the entire route will be an elevated one. At first the Metro track was to be modeled on Central Verge. However, it was diverted to Green Belt. As a deep sewer line falls in the metro track, the track has to be diverted to sector-63 instead of central verge. The route in which the proposed metro would be going is road no-6 (Model Town to Sector-71) and consists of three and four intersections. To streamline the traffic flow in these seven places, U-turns are to be made. As a result of which there would not be traffic chaos and at the same time the metro construction work would go rapidly. An awareness campaign will be conducted before the start of metro work. People will be told as to where the diversions have been made on this road due to the construction of the metro work. At what time the maximum crowd will be there at which area and what other roads people can take will be informed during this awareness campaign. The study conducted by the IIT, Roorkee, revealed that more than 3 lakh 50 thousand vehicles cross the road no- 6 (From Model Town to Sector- 71) everyday. This includes Heavy Motor Vehicles (HMVs), Light Motor Vehicles (LMVS) along with cars. For a smooth traffic, route diversions will be made along with deployment of police personnel in the concerned area. As an alternative arrangement, several underpasses have been made to tackle the situation. For a free flow of traffic, extra home guards will be deployed at several routes to avert any kind of crowd mess. NOIDA: In a bid to fast track the extension of the Metro line from Noida City Center to Sector 62, touching NH-24, the Noida Authority held a review meeting on Monday to take stock of all technical glitches pertaining to the proposed line. The change in alignment for the Metro line that was proposed by the Authority last month has been finalised and it has been decided that instead of being constructed on the right side of the green belt in the Flex crossing area, the line will now be constructed on the central verge of the Master Plan Road-III from Sector 32 onwards to avoid the high tension cables running over the green belt. In the meeting, Authority officials also took notes on other technical aspects including level of the Metro track, curvature turnings of the track, presence of any properties or obstructions on the proposed route, the spots proposed for stations, etc. The Authority has also decided that the alignment of proposed line must not disturb the existing commercial belt that surrounds all four sides of the proposed route. It will now inform the Delhi Metro Rail Corporation of all these points so that the latter can incorporate these in the Detailed Project Report. “After several surveys and detailed inspections, it was finally decided that the Metro line will be constructed along the central verge as proposed earlier with some minor adjustments. We carried out detailed inspections to ensure that the Ganga water pipeline, gas pipelines, sewage lines, telephone cables, high tension power transmission lines, and private properties were not in the way of the Metro alignment,” an Authority official said. “The review meeting was held to take stock of all these matters and to focus on fast tracking the metro project,” he said. To be constructed at a cost of Rs 1,805 crore, the proposed line between City Center station and Sector 62 near Indirapuram in Ghaziabad will be a great relief to commuters from Noida and Ghaziabad. As per current plan, the extended route will have six stations at Sectors 34/51, 71/72, 61, Mamura, Fortis, and Electronic City. Noida, January 28, 2012Noida too is going to join the growing number of cities that will have a monorail system in the next few years. Once the phase 3 Metro expansion is complete, the Noida Authority will start building a monorail network. lines — from City Centre to NH-24 and from Botanical Garden to Kalindi Kunj. “These projects are expected to be completed in four years. Then, we will begin work on monorail,” authority chief executive officer SK Dwivedi said. The Noida Authority is also working to improve its local bus network, which — going by its rickety fleet of state-run buses — is in a shambles. Dwivedi also revealed that the existing rickety buses will be replaced by swanky ones, complete with global positioning system (GPS). These buses, he said, will run on rapid transit corridors. “This will ease the perennial snarls and will also check accidents. We are formulating a special purpose vehicle to work on the upgrade,” the CEO said. Meanwhile, Greater Noida officials said the work on the proposed Noida-Greater Noida Metro link has been delayed due to fund crunch. “The project is tentatively billed at Rs 5,000 crore,” said Greater Noida CEO Rama Raman. NOIDA: Nearly four months after the government in Uttar Pradesh changed hands, the three development authorities — Noida, Greater Noida and Yamuna Expressway — held their long-awaited board meetings on Monday. Metro connectivity remained the focus of Noida Authority at its 176th board meeting. Apart from approving the DPR for a Metro extension between Kalindi Kunj and Botanical Garden, Noida Authority also gave its nod to a 7km link to Noida Extension. An exclusive Metro route between Noida and Greater Noida also got the board’s clearance. For the year 2012-13, the Authority allotted a total budget of Rs 7,021 crore for Noida. Of this, nearly 43% (Rs 3,000 crore) was allocated for development and infrastructure, besides Rs 500 crore for Metro extension. “The long-pending DPR of the 3.9km Metro route between Kalindi Kunj and Botanical Garden will now be forwarded to the state government for approval. After that an MoU will be signed and then we will release the funds for its commencement,” said Sanjiv Saran, CEO, Noida Authority. In an effort to provide Metro connectivity to lakhs of people who would reside in the ‘affordable housing hub’ Noida Extension in the next 2-3 years, the board approved a proposal to extend the City Center Metro line till the crossing of sectors 71 and 72. A DPR will soon be prepared for this line. While the stations will be marked soon, Noida Authority officials said at least two stations will fall in Noida Extension, near Gaur roundabout and Eco Village-III. “This 7km route will cost Rs 1,800 crore. Of this, Rs 1,100 crore will be shared between Noida and Greater Noida,” Saran said. A special Metro line connecting the twin cities also got the green signal. “We are working on a PPP model and studying the feasibility of constructing this 35km line. The project is estimated to cost Rs 200 crore per km,” the CEO said. The Authority fast-tracked proposals for the widening of two bridges over the Shahdara drain near Film City and before the Okhla Barrage. The board also approved the setting up of a centralized emergency helpline number that will cater to police, medical and fire emergencies. The number will be functional 24×7. “We are in the process of finalizing the blueprint of this project and should launch it on August 15,” Saran said. The Authority plans to establish a Rs 100 crore, IIT-Roorkee approved, UASB technology driven sewage disposal system, and identify a sanitary land fill site in Sector 123. Construction of underpasses, flyovers and foot over bridges across the city is also on the cards. Special schemes will be launched for banks and nursing homes which have been displaced after the Supreme Court ruling barring all commercial activity from non-conforming areas. Clogged roads and shared autorickshaws may soon be a thing of the past for Noida residents with the Uttar Pradesh government giving its nod to connect the Noida City Centre with Sector 62. The state government has given its go-ahead to the Delhi Metro’s detailed project report on the proposed Metro link between the two points. The proposed line, nearly 7-km long, will be an extension of the current Dwarka Sector 21- Noida City Centre line. The route, once completed, will connect the key industrial and residential areas of Noida with the rest of the network in the National Capital Region. Areas that the proposed line will pass through include Noida Sector 52, Electronic City, ending at Noida sector 62. Now that the DMRC has got the clearance from the state administration, the project report has been moved to the officials in the central government. It is likely to cost around Rs.1,850 crore. “This is an important route as it covers densely populated as well as VIP areas. All stations have been designed to be built above the ground so that they do not impede the traffic flow. For passengers’ comfort, we have proposed to introduce only 6 and 8-coach trains,” a DMRC spokesperson said. The Samajwadi Party (SP) government in Uttar Pradesh has made it clear that development of Noida is top priority for the party. immediate attention from Lucknow as well as the local administration. Authority officials said the focus would be on decongesting the national highway-24, a new bridge over the Yamuna for better Noida-Delhi connectivity, new Metro lines, a solid waste management plant, a modern sewage treatment plant, besides some flyover and underpass projects. When Akhilesh replaced Mayawati as chief minister, there were apprehensions in certain quarters that Gautam Budh Nagar (home district of Bahujan Samaj Party chief and former CM Mayawati’s home district) comprising Noida and Greater Noida would lose the special status. That the three assembly seats in the district did not elect even a single SP candidate in the recent assembly elections fuelled such feelings. The apprehensions further grew when all top officials of the Noida authority – replacements for chief executive officer and chairman are yet to come – and the police/civil administrations were changed and the government began a review of all of Mayawati’s dream projects. “But the new government clarified that electoral politics aside, there will not be any comprise with infrastructure development and quality of life in Noida,” said a senior authority official. The scene in Greater Noida is not much different. “The chief minister has sought a report on all stuck infrastructure development projects, especially the one for Metro expansion,” said a Greater Noida authority official. A Metro expansion has been planned from Noida to Greater Noida. A detailed project report (DPR) is also ready. “The new government has put the Greater Noida Metro project on top of its priority. Fund crunch would not be allowed to halt the project any more. If need be, we will seek assistance from the Noida authority,” said authority CEO Rama Raman. The new industrial development commissioner of Uttar Pradesh, Anil Kumar Gupta, also recently visited Noida and asked senior officials here to accelerate the pace of development. He met officials of all the three industrial development authorities in Noida, Greater Noida and Yamuna Expressway and reviewed various development projects. –National highway 24: The link which touches Noida, Ghaziabad and takes motorists to Delhi, is highly congested and needs to be widened. Underpasses also need to be built. –Construction of a bridge (addition of four lanes to the existing one) over the Yamuna. The Delhi-Noida connectivity project will be an alternative to DND toll flyway and will cost Rs. 300 crore. –The city generates 400 tones of waste every day but a solid waste management plant is yet to be put in place. Disposal has meant throwing garbage in vacant areas and pits. –The Noida authority has planned to use a modern technology for treatment of sewage water. Now, there will not be emission of harmful gases such as methane. –The focus will also be on building new flyovers, underpasses, besides adding green cover in the city. Noida and Greater Noida are to get a new lifeline, as tracks are clear for the Metro line here.The authorities concerned have approved a major detailed extension of the Metro route connecting almost all of Noida and Greater Noida at a cost of Rs 10,000 crore, covering a total of 86km. The DMRC ( Delhi Metro Rail Corporation) has given a go-ahead to this project and it is likely to be completed by 2015. Besides extending the existing City Centre Metro route connecting Kalindi Kunj and Botanical Garden, a new line from the City Centre station connecting Sector 32 to Sector 62 and touching NH-24 , was also approved. 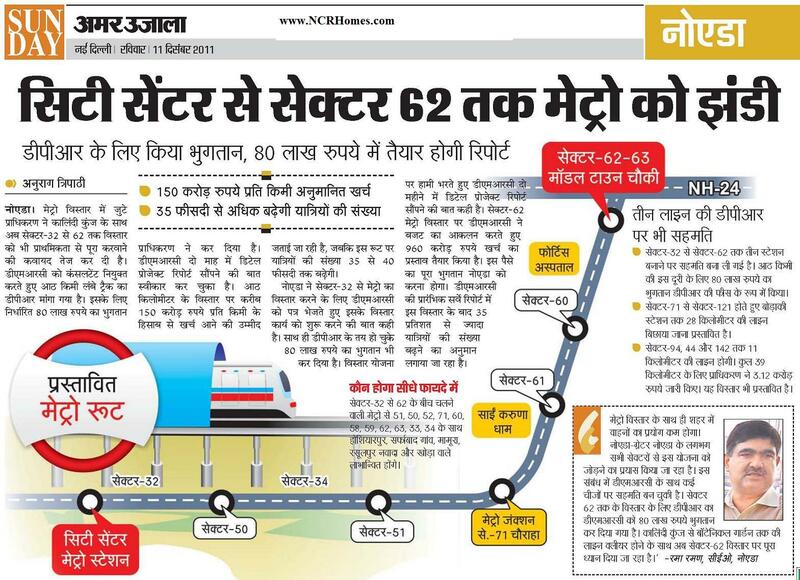 This new 6km route will be via Sector 71 crossing and will provide connectivity to Sectors 32, 34, 35, Hoshiarpur, Sectors 51, 52, 71, Greater Noida Extension Marg, Sarfabad, Sectors 60, 61, 62, 63 and NH-24 . A new loop from Sector 71 via Sector 121 will then join the Greater Noida route between the City Centre and Bodaki railway station in Greater Noida. This route will be from the City Centre along the Greater Noida Expressway , touching Knowledge Park 4 via Pari Chowk and will finally end at Bodaki. The new loop has been added mainly to connect Noida Extension, which is near Sector 121, with Noida as well as with Greater Noida. If the project runs on schedule, there will soon be a direct Metro connectivity between Noida and areas in South Delhi like Kalkaji, Malviya Nagar, Nehru Place, Green Park and Vasant Kunj. At present, commuters have to take the Noida-Dwarka route and get down at Rajiv Chowk station to change lines. Experts believe it will boost real estate market in Noida, Greater Noida and the neighbouring areas. The new link will also be a part of DMRC’s Phase III expansion plan, which will now cover 105km, instead of the earlier proposed 70km, to enter areas like Faridabad and Noida. In addition, Noida will also be floating the tender for the extension of the Metro line from Noida City Centre to Bodaki in Greater Noida. Rama Raman, the chairman and chief executive officer of Greater Noida Industrial Development Authority (GNIDA), says: “Once the project is complete, it will be easy to move from Delhi to Noida-Greater Noida and Ghaziabad, as the authority has designed this Metro connectivity project. For the first time in India, commuters will have an elevated road and a Metro corridor built on the same Metro pillars. constructed vertically parallel to the Metro line passing through the heavily congested 6.6 km stretch. Though final approval from DMRC is awaited, the authority officials said the first-of-its-kind structure would be the ultimate solution to traffic woes in this part of the city besides significantly cutting short the construction cost and time consumption. The proposed Metro line would be a 6.6-km-long elevated corridor at an estimated budget of Rs1,800 crore. The proposed Metro corridor would have five new stations. The project is expected to be completed by 2016. As the authority officials pointed out, the elevated vehicle corridor from City Center to Sector-62 has to be constructed to decongest the area; constructing it along with the Metro corridor would save time and money. Subject to approval from the DMRC, the detailed plan of the elevated road would be submitted to the DMRC for further consideration. “The elevated road will be 5.5 metre above the road surface. Similarly, the Metro viaduct will be at a height of another 5.5 metre from the elevated road. This would take the total height of the Metro corridor to 11 metres from the road surface,” said a Noida authority official. Chandra Bhanu Singh, Deputy Chief Executive Officer, Noida authority said, “We are examining the Detailed Project Report (DPR) prepared by the Delhi Metro for the new corridor so as to find the possibilities of merging the two projects together. A memorandum of understanding for execution of the Metro construction work will soon be signed between the authority and the DMRC. However, we have urged the DMRC to incorporate the elevated road project with approved plan.” Officials said the new project will be time-saving as it will require only one foundation for the two structures and also the same will be cost-efficient. An official said the Noida authority will spend over Rs1,000 crore on the project. As they claimed, the corridor will immensely benefit lakhs of people residing in areas like sectors 32, 34, 35, 50, 51, 52, 60, 61 and 62 among others. Some of these residential areas are posh localities. According to officials, this will also help in reducing traffic congestion on the roads connecting to NH 24 which witnesses heavy vehicular volume at any point of the time. R1,800 crore. The project is likely to be completed by 2016. “The DPR is being studied. A memorandum of understanding will soon be signed between the authority and the DMRC,” said CB Singh, deputy chief executive officer, Noida authority. There will be six new stations on the extended line, which is expected to resolve the problem of traffic congestion. People living on both sides of NH-24 will benefit from this project. The Ghaziabad Development Authority (GDA) would hold a high-level meeting with DMRC officials and the UP chief secretary at Lucknow on Tuesday to discuss methods to expedite extension of the Metro line from Dilshad Garden to Arthala. “We are confident that some concrete decision would be taken at the meet,” said GDA vice-chairman Santosh Kumar Yadav. GDA officials would discuss the extension of the Metro line from Dilshad Garden in Delhi to Arthala (near Mohan Nagar) in Ghaziabad. The 7.31km extended line would have six stations. This route would largely cater to the trans-Hindon areas of Sahibabad, Vasundhara, Lajpat Nagar, Rajendra Nagar and Shalimar Garden. The project has an estimated cost of R815 crore and the inability of GDA to solely fund it caused delays. NOIDA: The Greater Noida Industrial Development Authority (GNIDA) and Ghaziabad Development Authority (GDA) have agreed to complete the construction of a 60-metre-wide and 12-km-long expressway between the two cities in the next six months. With this, the travel time between the two cities will reduce to 20 minutes. The road links Vijay Nagar off NH-24 (Ghaziabad) and Gaur Sons crossing at Noida Extension, Greater Noida. From Noida Extension, another stretch takes motorists to Pari Chowk in Greater Noida. GNIDA chairman Rama Raman and GDA vice-president Santosh Yadav met on Monday and cleared the project. The project had been delayed for the past 10 years because of land acquisition issues. Most of the project is ready, but a small portion (1.5km) falls in the abadi area of Ghaziabad. Of it, only 500 metre stretch is incomplete. At present, it takes 60-90 minutes to reach Greater Noida via any of three routes. Noida: In a big respite to the metro commuters visiting Noida and Delhi, the Noida Development Authority on Tuesday gave green signal to the DMRC‘s technical report on metro line expansion to sector 62. As per the sources, the Delhi Metro Rail Corporation will submit the detailed project report (DPR) on the extension plan by next week. The DMRC had given the technical report on the Delhi-Noida metro line extension project last week to the Noida Development Authority for its final nod. As per the proposed plan, the existing Noida City Centre metro line will be connected to the Vaishali metro station. The proposed metro line will cover NH-24. The construction on proposed extension project is likely to commence after the authority gives its final clearance to the DPR submitted by the DMRC next week. Noida: Delhi Metro Rail Corporation is trying hard to proceed towards extension of Metro from Sector 32 Metro Station towards Sector 62. After getting nod over technical report the DMRC team is trying hard on Detailed Project Report but there is a delay of one week for completing the DPR. The Delhi Metro Rail Corporation has cleared that there are some changes to be made at the level of Chief Engineer; therefore the report will be sent by next week. Metro will cover a distance of 8 more kilometers in Noida. After that Metro will enter into the territory of Ghaziabad thus leaving the jurisdiction of Noida. Earlier on March 13 Noida Authority approved the technical report, DMRC has asked a week’s time before submitting the DPR. The Authority will spend Rs. 1200 crore for the construction of 8 kilo meter long Metro Line. The DMRC officials have informed that modifications are being made at some points. About three to four days will be required for modifications then the DPR will be sent to NA. The officials also said that the designs have also been finalised after the task of surveying was completed. Thus DMRC is pretty confident that the move will help in fast construction of the Metro track. The DCEO of NA, CB Singh hopes that the DMRC will hand over the DPR by March 19-20. Then the Authority will start the procedure after holding a meeting of officials. Work on the Noida-south Delhi Metro line will begin from January next year, a Noida Authority official said on Wednesday. The new line will, however, be opened for public only by 2016. Presenting the detailed project report (DPR) before Noida Authority officials on Wednesday, the Delhi Metro Rail Corporation (DMRC) said the 3.9 km line between Noida’s Botanical Garden and Kalindi Kunj in Delhi would cost R874 crore. The cost will be borne by the authority. The line will have three stations: Botanical Garden, Amity School and Kalindi Kunj. As of now, the Delhi Metro enters Noida and Ghaziabad in UP via east Delhi. The new line will mean a direct link with south Delhi areas such as Kalkaji, Malviya Nagar, Green Park and Vasant Kunj. Currently, commuters have to take the Noida-Dwarka route and get down at Rajiv Chowk to board the train to south Delhi. Similarly, commuters from Badarpur coming to Noida have to change at Central Secretariat. The new plan will make these trips shorter. “The new line will be built as part of the third phase of DMRC’s expansion plans to enter outer Delhi areas. We will study the DPR from the point of view of technical and financial feasibility,“ said Chandra Bhanu Singh, deputy chief executive officer, Noida Authority. “The execution of the project will begin after the authority and DMRC sign a memorandum of understanding (MoU). Tenders will be floated in January,“ he added. The authority and DMRC will meet again on December 22 to fine-tune the project. “This line will help commuters going to south Delhi and the airport in saving time. Once the line opens, more people from Delhi will shift to Noida and Greater Noida. This will also ease vehicular pressure on roads,“ Singh said. NOIDA: Delhi Metro Rail Corporation (DMRC) made a presentation before Noida Authority for the 4km metro route between Botanical Garden and Kalindi Kunj as part of its phase-III plan, on Wednesday. While the technical and financial feasibility studies are expected to be completed in another week, the final approval and signing of MoU will soon follow. The DMRC handed over the detailed project report ( DPR) to the officials of Noida Authority for the 3.9km route, which is estimated to cost Rs 874 crore and expected to be complete by 2016. “It has been decided that the Centre will grant Rs 114 crore for the project, while the Authority will bear a cost of Rs 457 crore besides the cost of the land which is about Rs 65 crore,” said CB Singh, deputy chief executive officer of Noida. “The rolling stock for the DMRC has been fixed at Rs 151 crore,” Singh said. “The alignment for the track is being finalized and will be discussed during the next scheduled meeting on December 22,” Singh added. Once completed, commuters will no longer have to travel to Rajiv Chowk Metro station to connect to line 2 (Huda City Centre to Jehangirpuri) as the proposed phase-III extension line will form a ringed route. The proposed line will be connecting Botanical Garden station with Hauz Khas station via Amity University, Kalindi Kunj and Kalkaji temple station. Commuters will get three exchange points on this route. Kalindi Kunj station will provide a link to Badarpur Metro and Faridabad, whereas the Kalkaji temple station will connect to Central Secretariat Metro station. The third junction will be Hauz Khas station where commuters will be able to change for Metro heading towards Huda City Centre and Jahangirpuri Metro stations. Noida: Noida Authority Thursday gave its nod in principle to Delhi Metro Rail Corporation (DMRC) for extending the Kalindi Kunj metro line here. The approval came from Noida Authority CEO Rama Raman after DMRC presented a detailed project report on Kalindi Kunj extension plan at a meeting here. Slated to be completed by 2016, the project is estimated to cost Rs 874 crore. From Kalindi Kunj to Botanical Garden, the metro line would be 3.9 km long with two stations at Amity School and Kalindi Kunj. The poposed line would connect Sarita Vihar and Kalkaji-Nehru Place. The CEO directed the chief project engineer to study the report and also look into the facilities to be provided for it. The next review meeting is scheduled to be held next week. NEW DELHI: The NCR concept just got a shot in the arm. In a bid to connect the various parts of Delhi with the neighboring areas of Bahadurgarh, Noida, Gurgaon as well as Faridabad, the Delhi Metro will be going further inside these NCR areas in the third phase of its network. While the detailed project reports (DPR) for the extensions to Gurgaon, Faridabad and Bahadurgarh is ready and have been sent to the ministry of urban development for approval, the alignment for extension to Noida’s sector 62 is still under finalization. Work on all the connecting extensions to the NCR areas is expected to be undertaken by 2012, to be part of the Delhi Metro’s phase III construction. With these alignments, the Delhi Metro will be blurring the state lines further and underlining the NCR concept, say officials. Said a spokesperson from the Delhi Metro Rail Corporation, “The empowered group of ministers (EGoM) has directed that the lines (connecting the NCR) may be considered for inclusion in Delhi Metro Phase III and a separate proposal be brought for consideration of the EGoM. We are in the process of finalizing all the alignments at present.” The alignments include the extension of the existing Mundka corridor (Mundka-Inderlok) to Bahadurgarh, crossing the Tikri Border via Ghevra. The other line extension is that of the Yamuna Bank corridor to Noida’s sector 62 via sector 32. This corridor at present is till Noida City Center. Another line extension – of the new Mukundpur-Yamuna Vihar corridor of Phase III on to Shiv Vihar, an expansion by 3km, will also bring the outskirts of Delhi into closer contact with the central parts. That’s not all. As reported by TOI earlier, the extension of the Dwarka sector 21-Noida City Center line to IFFCO Chowk via Palam Vihar along with the extension of the Badarpur corridor to YMCA Chowk in Faridabad is also on the cards. This is besides the new corridor from Dwarka to Najafgarh, stretching over 13.875km, which has been sent to the ministry of urban development already for approval. Sources in Delhi Metro said that these alignments had been also clubbed with the three new extensions – Bahadurgarh, Noida sector 62 and Shiv Vihar, as a separate proposal for EGoM approval. “The proposal is for inclusion in the Delhi Metro Phase III, which means that work will need to be started by 2012. The DPRs of all these alignments have been put on fast-track,” said the Delhi Metro official. The Delhi Metro Rail Corporation (DMRC) will begin work on a Noida-south Delhi link from January. line between Noida’s Botanical Garden and Kalindi Kunj in Delhi. This will mean a direct link with areas such as Kalkaji, Malviya Nagar, Green Park and Vasant Kunj. Currently, people have to take Noida-Dwarka route and get down at Rajiv Chowk station to change lines. 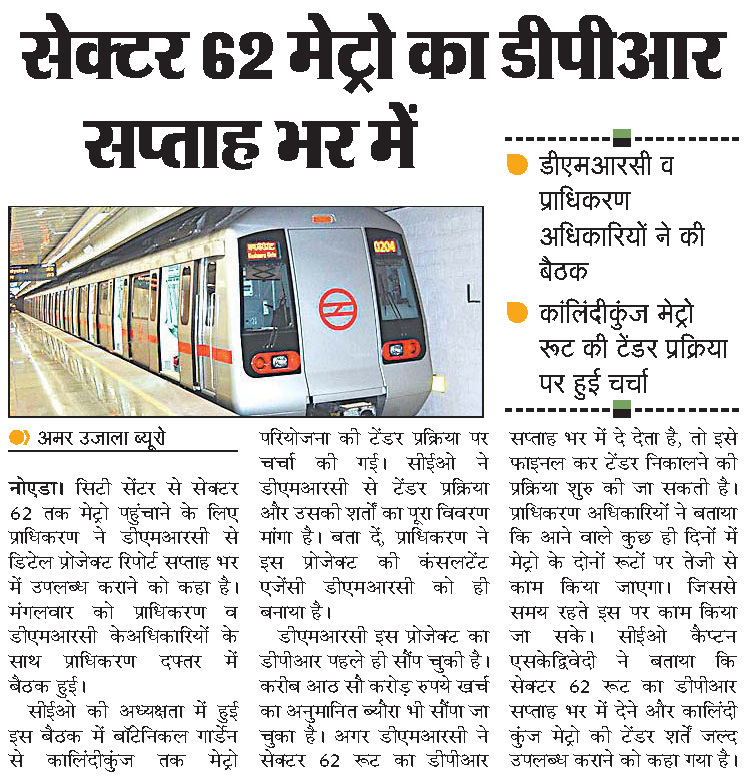 The DMRC is also preparing a DPR to extend the Metro line in Noida up to the Ghaziabad border at sector 62 (NH 24). Work will start early next year. After this extension, Metro will cut Noida into two, providing a boost to intra-city connectivity. Currently Noida has six stations of Delhi Metro with the service ending at sector 32. The existing line caters only to 55 immediate and adjoining sectors. 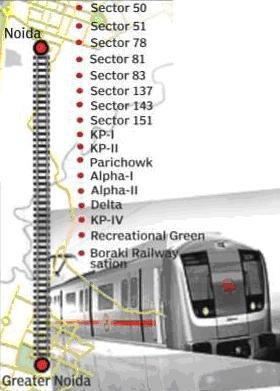 About 35 more sectors need to be linked to Metro to relieve people of travelling woes. Noida-Greater Noida and Ghaziabad are on a decongestion drive and are moving ahead to declog the roads and highways leading up to Delhi. The Greater Noida Industrial Development Authority (GNIDA) has planned to build four underpasses, two elevated roads and an extension of Metro link for the purpose. A detailed project report (DPR) for these projects has already been approved. Noida-Greater Noida authority is approaching the departments concerned to raise funds. If these projects see the light of day, property rates in this region may double. Rama Raman, CEO of GNIDA, says: “After submission of the DPR, we are approaching financial institutions for viability gap funds and tax exemptions to meet the requirement. According to our plan, 16 Metro stations have been proposed in the 28km-long Noida-Greater Noida Metro link, which will cost around Rs 4,000 crore. Nearly 65,000 daily commuters are expected to use the facility during peak hours. Soil testing and other project-related work is expected to commence this November and the whole line is slated to be completed by 2012. This proposed Metro link will connect Ghaziabad in the second phase of the plan. To connect the twin cities to all the other NCR cities like Ghaziabad, Gurgaon and Faridabad, GNIDA has made out a proposal – the chain of connectivity – which has already discussed with the DMRC. For the chain of connectivity, GNIDA has proposed two new Metro links which cover all the major areas of Delhi and the NCR. Under the new Metro Link 1, existing Metro terminal at Sector 32 (City Centre) will be extended up to Sector 62 and further connect Ghazipur (Delhi). This new link will cover G h a z i p u r, K a lya n p u r i , Mayur Vihar Phase1, Sarai Kale Khan, Moolchand, AIIMS and Bhikaji Kama Place. And through a new Metro Link 2, Sector 18 will be extended up to NH8. It will cover AIIMS, Okhla, Nehru Place, Malviya Nagar and Vasant Kunj. This will further connect to Gurgaon and Faridabad via Central Secretariat and Badarpur. In addition, the Metro project is to be implemented in Ghaziabad in three phases. The first link to Vaishali is already underway. The 2.52km-long Metro link will originate from Anand Vihar, which is directly linked to Rajiv Chowk via Vikas Marg. The estimated cost of Anand Vihar-Vaishali Sector is Rs 300 crore. For this, the UP government has paid half of the amount to DMRC. This route will go up to Indirapuram, which connects to Noida Sector 32 via Sector 62. Extension of Vaishali-Indirapuram Metro route is now under progress. Further, Vaishali-Indirapuram will link to Mehrauli via Noida crossing 62, CISF, Pratap Vihar, Dundahera and Shahapur in Phase 2. The length of this line is 16km. The total travel time to Rajiv Chowk is 35 minutes. In Phase 3, the Metro will connect Ghaziabad bus stand to ISBT (Kashmere Gate). The length of this line will be 12km. To improve the city-level infrastructure, Noida and Ghaziabad entered a new phase of development with intense planning and implementation civic and social infrastructure. In Ghaziabad, road infrastructure is slated for a major boost with 17 flyovers, including three clovers leaf ones, to be implemented over the next five years. An MoU has been signed with the UP State Bridge Corporation Ltd (which made the AIIMS and Dhaula Kuan flyover in Delhi) for five more flyovers, including a clover leaf at Meerut road crossing. Apart from this, the Metro link will provide a network and not just as a token presence in the region. The city will benefit from the 6/8-lane expressway linking Delhi to Meerut, Hapur and Bulandshahar. These three expressways, as well as the Delhi Metro peripheric (planned along the lines of the Paris peripheric) will be part of the new development in Ghaziabad. The Metro touching the Anand Vihar bus terminal is making headway. Like Noida and Greater Noida authority, the Ghaziabad Development Authority’s (GDA) proposal of an express highway linking Meerut crossing to NH 24 will create integrated flyovers at all level crossings. In addition to the Metro service, the Northern Railway project (Integrated Railway-Bus Transport system) will make commuting easy between Ghaziabad and Delhi.